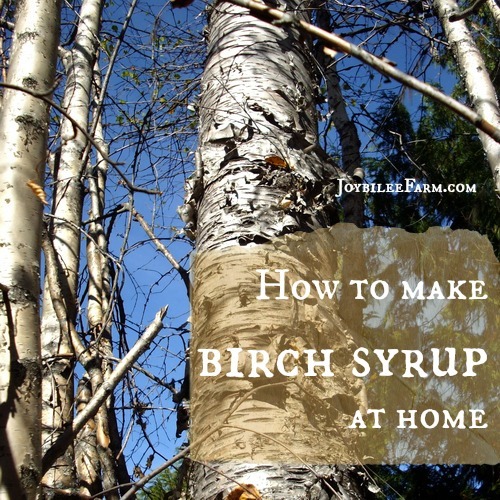 Make Birch syrup from your homestead birch trees. 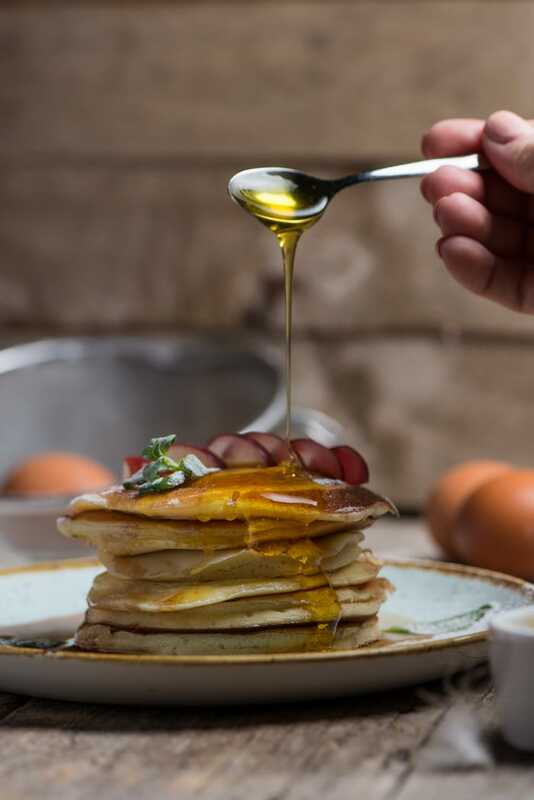 You don’t need maple trees to make delicious and healthy syrup. Birch trees, alder, hickory, walnut, beechnut, and box elders can all be tapped for their sap in early spring. Here’s what you need to know for success. Birch syrup is a specialty syrup grown in the north country, and in Northern Europe. Along with birch beer, birch wine, and birch mineral water, it is a considered a natural health product and commands high prices. At $25 to $30 per 8 oz (250ml) bottle, it’s a luxury product that you can make yourself on your homestead. While sugar maples grow abundantly in the east, birch trees grow throughout temperate North America and in Europe and their tapping season follows the maple sugar season. We’re coming up to the season and this tutorial on making birch syrup will help you get the most of the sugar tapping season in your area — whether you have abundant sugar maples, other maples, birches, or even walnut, hickory, alder, or linden trees. Sugar tapping is a fun, family activity, so be sure and include your children in this healthy, outdoor activity. First, you don’t need to choose between tapping maple or birch or walnut trees. The season for the most sap running in the tree varies with the different species during the sugaring season, beginning with maple trees, followed by box elder, walnut trees, and then birch. You can use the same tools for tapping birch trees that you used for tapping sugar maples, black walnuts, and box elders. Birch sap season is usually after maple sugaring season, in areas where both trees are found growing together. Birch sap can be used to make birch syrup, birch wine, and can be drunk like tonic water for a refreshing drink. Birch trees begin to run sap about the time the maple trees are finished. Before the buds swell up and burst into leaves – usually when the nights are still below freezing but the daytime temperatures are above freezing – end of February to the middle of March in BC or even into the first part of April, depending on the year. When the night time temperatures are below freezing the sap in the tree is frozen, too. But as the day time temperatures move above freezing the sap in the tree thaws and starts to run from the roots. This creates pressure in the tree pushing the sap from the roots up into the branches. Soon that sap will reach the top of the tree and push life into the leaf buds. The leaf buds will swell and then burst open. Once the night time temperatures remain above freezing, the birch trees leaf out and the pressure on the sap equalizes. The window of opportunity to tap the trees for sap ends. First find birch trees that haven’t been exposed to pesticides, herbicides, or petroleum contaminants. Trees along the side of a highway wouldn’t be a good choice. Trees are being used as buffers to separate highway noise and pollution from residential areas. Leave these trees alone, as they will carry their trapped pollutants into their sap. Only 1 tap is placed in a birch tree and only healthy trees 8 -14 inches in diameter or bigger are tapped. Look for the trees with the largest crowns. These will have the most sap. Put your tap hole 4 feet up from the base of the tree. A spile, handmade or you can buy commercial spiles. You can use the same spiles that you used for maple sugaring if you have any. You can make a spile on a wood lathe by following the directions here. A hand brace or cordless drill A bit for the brace or drill that matches the tapered end of the spile A rubber mallet for setting the spile Alcohol wipes for cleaning the drill bit and spile before tapping the tree A collection container with a cover. My favorite is the 5 litre water jugs you can get with grocery store filtered water. A brace bit or drill bit the size of the largest end of your spile to make a hole in your collection container. Photo courtesy of “Turning for Profit”. Used with permission. Pick a spot on the birch tree that hasn’t been tapped before. Place the new tap at least 6 inches away from any previous taps, preferably in a shady spot on the south side of the tree. Clean the bark in this spot of debris, moss, lichens. The tap should be on smooth wood that is free of disease. Use an alcohol wipe to disinfect the bark in this spot. Clean the drill bit and the taps with alcohol to minimize bacterial contamination of the tap site. You’ll want a sharp drill bit for a clean cut. Place your drill bit at a 20 to 30 degree angle upward so that the sap will run down into your container. A higher degree angle may cause the container to pull the spile out of the tree as the sap collects and the container gets heavier. Drill in 1 inch to 1 ½ inches (2 to 4 cm), below the bark into the wood – look for a bit of moisture. Don’t drill into the heart wood or you may damage the tree. Drill a nice round hole rather than an oval hole. The saw dust should be all white wood with no dark wood. Dark wood indicates that the tree is diseased or dying. If you encounter dark wood, you’ll want to find a different tree to tap. Clean any debris out of the hole with sterile tools or a splash of sterile water to avoid introducing bacteria into the tap hole. This extra care to avoid bacterial contamination at the tap site will increase the lifespan of your birch trees. Place your spile by setting it in place in the fresh hole and tap into place lightly with a rubber mallet. You should see sap dripping from the spile in a few minutes. At the peak of the sap season the drip will run at 4 drops per second. If there is no sap at all, try another tree. Take your collection container and create a hole to place over the tap, if necessary. 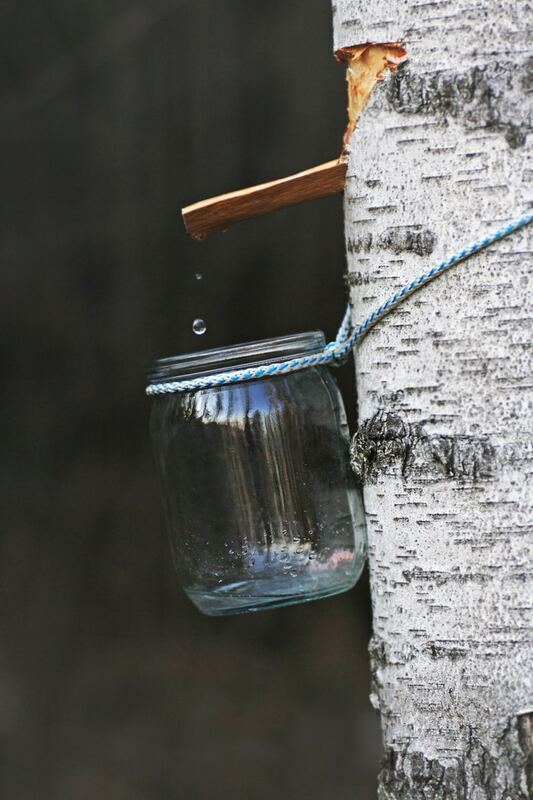 The average birch tree will give 1 gallon of sap per day, so ensure that your container can hold that much. Hang your bucket or collection container off the end of the tap. The collection container should be covered to keep out bugs and debris. The container should be high enough up in the tree to prevent it from being spilled by animals walking by. About 4 feet up from the base is good. You can even place it higher if you suspect it might be tampered with. Collection buckets placed on the ground can be spilled. Collect the sap from each tree every morning during the sap season. If left longer the sap begins to ferment and the syrup will taste off. The sap will be clear like water with a slightly sweet taste. 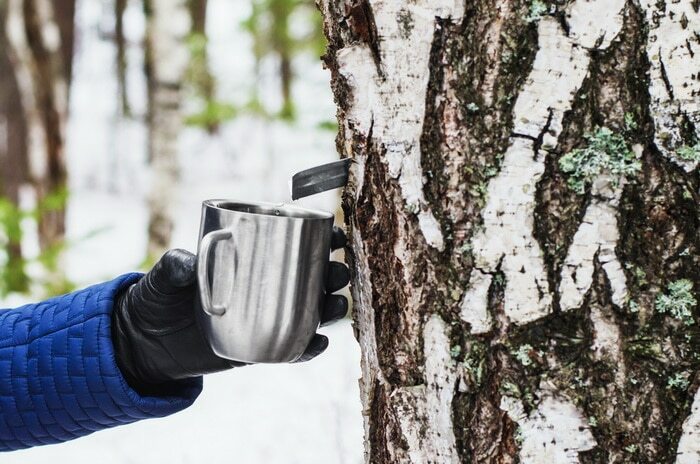 Silver birch and white birch have a clean taste with just a hint of sweetness, whereas black birch has a slight wintergreen flavour when fresh sap is tasted. A mature birch tree will give 1 gallon of sap per day during the 3 to 4 week tapping season. It takes 25 gallons of birch sap to make 1 quart/litre of birch syrup. So you can expect about a quart of syrup from each mature birch tree that you tap over the 3 to 4 week season. 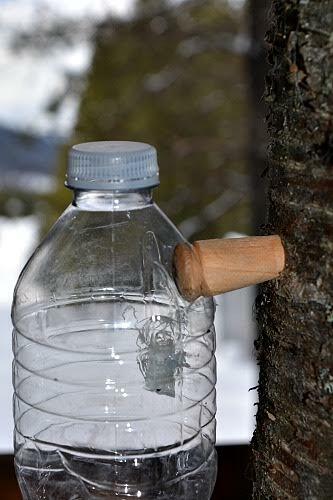 Gather your sap every day during the 3 to 4 week season. Evaporate the sap as you collect it. It will begin to ferment if left at room temperature. Making birch syrup from birch sap is different than making syrup from maple sap. The sugar (fructose) in birch sap is easily caramelized during the evaporation process. The best tasting birch syrup comes from sap that is evaporated slowly, rather than boiled hard, like maple sap. It is a labour intensive process. Making syrup from tree sap creates a lot of moisture. If you are heating with wood then you might not mind the sudden increase in humidity that making syrup at home brings. Some folks prefer to make sugar from sap outdoors, where the excess steam produced won’t be problematic. If you intend to make syrup on an ongoing basis consider erecting a sugar shack on your homestead. This post assumes you are working in your home with smaller amounts of sap. Tapping 8 to 10 birch trees will give you about 8 to 10 gallons of sap each morning, over a period 14 to 30 days. 10 gallons of sap will evaporate down to about 400 ml of birch syrup, a scant two cups, for each day of production. If you are heating already with wood, keeping 3 – 4 gallon stock pots evaporating may not seem like a huge task. You’ve got the wood stove heating anyway. While maple syrup makers use a low evaporation pan, you’ll find that birch sap, with its higher water content, works well in a stock pot. The sap should be kept cold and processed into syrup within 24 hours of collecting. The kind of evaporation system used for maple syrup runs too hot for birch syrup. Birch sap should be processed at lower temperatures to keep the sugars in the syrup from caramelizing and giving the syrup a burnt taste. Filter the birch sap through a fine filter like a coffee filter before adding it to your evaporation pan. Begin by boiling the syrup rapidly but avoid scorching. You’ll have a better product if you live at a higher elevation and can get the syrup to boil before it reaches 200F. As the sap is reduced by about half, slow down the evaporation process to just a simmer. Simmer the syrup on low, keeping it just below boiling – reduce the heat to keep it from scorching. If you see it starting to brown rapidly, immediately remove it from the heat, and slow down the boiling process. This is where you need to watch it carefully. Once it’s starting to get to the critical stage, at about 25% of it’s original volume, you can move it to a crock pot or double boiler to finish the last stage of the cooking process and avoid burning the syrup. Pour it into your crock pot and put it on low heat. You’ll be able to leave it overnight on low to complete the evaporation process, if necessary. Check your crock pot and be sure that the low setting doesn’t raise the temperature of the boiling sap above 200F and you’ll be successful. 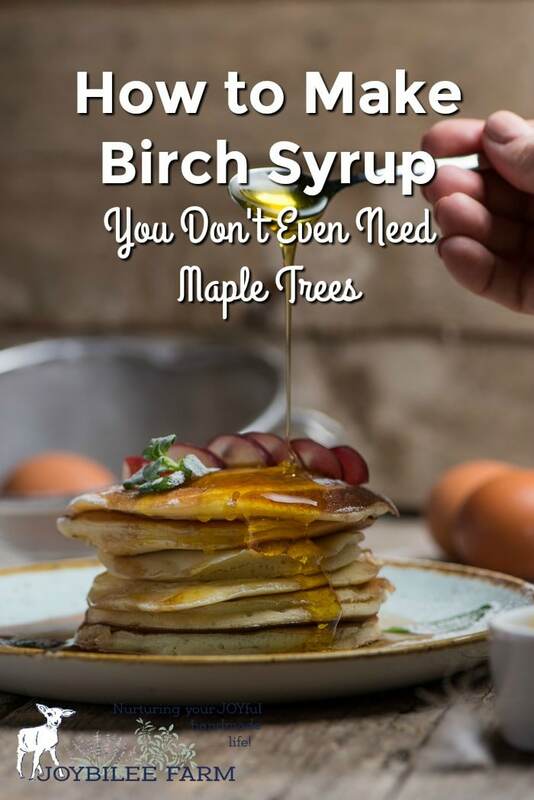 Birch syrup won’t thicken while hot in the same way the maple syrup does. Instead use a hydrometer to check the density of the syrup. The finished syrup should be 66 to 67 on the brix scale. Grab the directions over on Turning for Profit and you’ll be able to make spiles out of the wood you have on hand. Alexander Yerks from New York demonstrates how to carve a spile from a green branch and how to tap a birch tree with just a knife and an axe. Which trees are in your landscape that can be tapped for sap that can be boiled down into syrup. Learn their location and the best time to tap in your area. Start making the spiles now and gathering your supplies so that when the sap flows, you are ready. I found birch syrup very bitter. If you filter it out, you lose the valuable minerals, don’t you? One of my birch trees has sap that is tinted orange. Is that safe to use or should I dump it? Is it maybe due to a fungal infection? 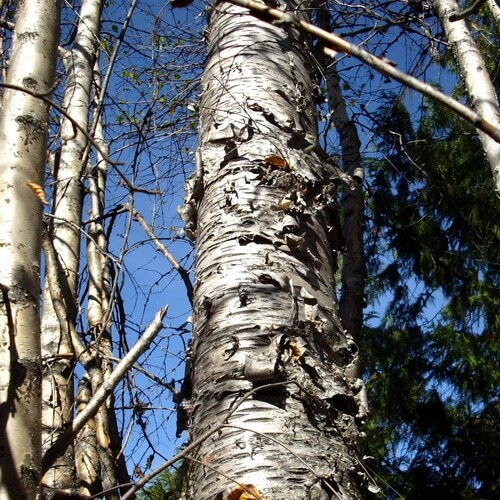 This is really interesting – I had no idea that birch sap was ingestible! This is really a great alternative to maple syrup. Never knew that you could tap all of those other trees too. Walnut isn’t tapped very often, the wood is too valuable to be damaged. Having said that, I learned to make spiles for tapping by cutting sumac about 4 inches. drilling out the pith, shaving down one end with a pen knife to fit the tap hole and putting a notch in the other to hold the bucked. Originally I used plastic one gallon milk jugs for “buckets” they worked fine except on windy days. So a bungee cord was the answer. Ash don’t make very good syrup either…Lesson learned. I mistakenly tapped one. I got no sap all season long, I thought the tree was dead, until someone pointed out is was a white ash. Good idea to carve your own. Add Basswood to that list. Basswood (or Lindonwood) syrup is quite tasty. Really curious about Basswood syrup, but I can’t find anything on it anywhere. What does it taste like? Thank you . I’m excited and happy to know about tapping trees for syrup.and so many kinds of trees . yippee! Wow! 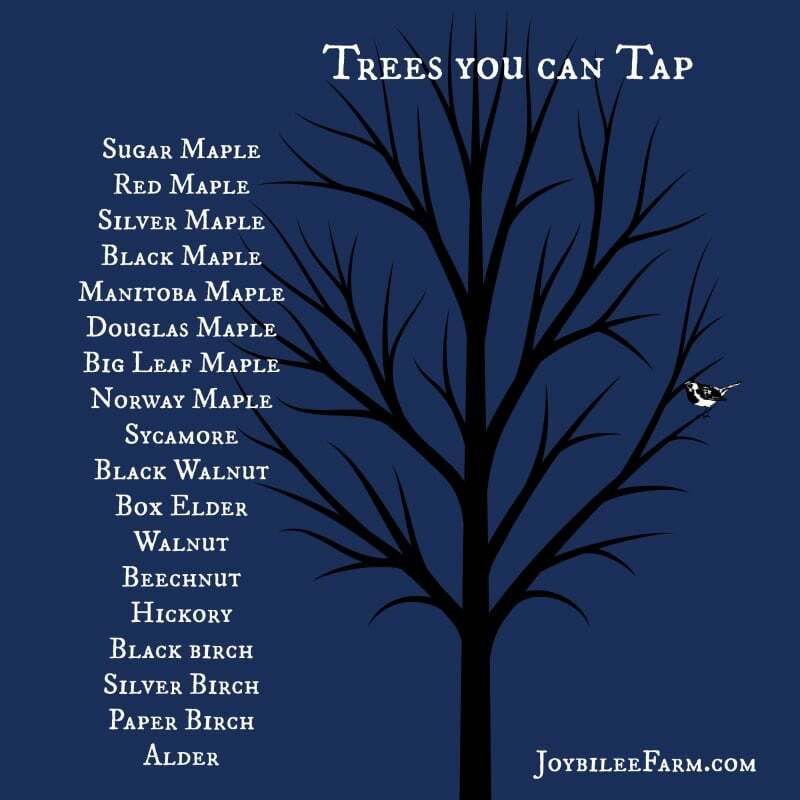 I am tapping my silver leaf maples…who knew!? Thanks! Bonnie – did you end up tapping the silver birch? How did it turn out? I have many more silvers than white birch. Thanks for the give away. New skills are great! I love your website and i am so excited to learn more about tapping trees and that there are other trees that can be tapped. This is something I want to share with my Grandchildren. Learning new skills and sharing them with grand kids is the peak of Joy. I hope you get to do exactly that. I had heard you can tap a couple different trees, but look at that list! Wonderful, thank you for all the information and the inspiration. Here’s to a good sap running spring SOON! Tapping trees looks so fun! It’s the one thing that makes me yearn to live up North…for just a wee little bit. But you have grapefruit and meyer lemon trees in your backyard. Sigh. We have plenty of maple trees, but sugar maples are difficult to grow in my area. I would really like to get some use from all these silver maples. Thanks for the giveaway. Would love to have the kid’s kit for my granddaughter.